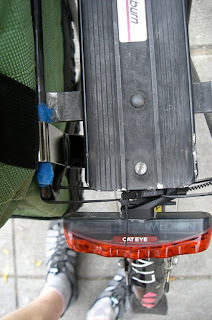 I was really excited when I received my new Detours Toocan "utility" pannier. Detours now has a Seattle office and their products are affordable and fun. 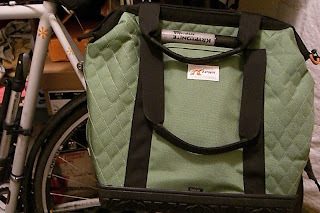 Just as described, the outside of the pannier has a quilted appearance and looks to be very durable. There is also a pocket which is sized just right for my u-lock. The inside was more of a mystery, as the website description lacked details about it, but I was pleasantly surprised to find several pockets inside. First, there is an inner lining which has a pocket on each side of the pannier, giving two narrow pockets and two wide ones. The wide are the right width for notebooks or books and the narrow are good for eating utensils, pens, a rolled-up jacket, you get the idea. There is a small zippered pocket up near the top opening which appeared to be full. I unzipped it and, voila!, there was a rain cover inside. This is going to come in very handy in the winter in Seattle (ok, so it rains all year 'round here). I really like having my wallet and other essentials in a zippered pocket so I moved the rain cover to a narrow inside pocket and replaced it with wallet, phone and lip stuff. There is still plenty of room in the main body of the pannier for groceries and what have you. It has a hard rubber bottom that stands by itself and protects the inside from water seeping in. I can't tell you how many times I've gone to a store, put down my non-Detours pannier and watched as it slid down to lay on the floor, getting dirty and making me feel disheveled. 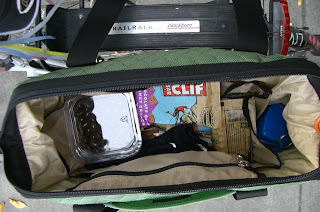 Then, I loaded the pannier with my notebooks, snacks and rain gear and zipped the whole pannier closed so I could go out and give it a road test. The attachment to the rack is with 2 stainless steel clips that hold onto the top of the rack. 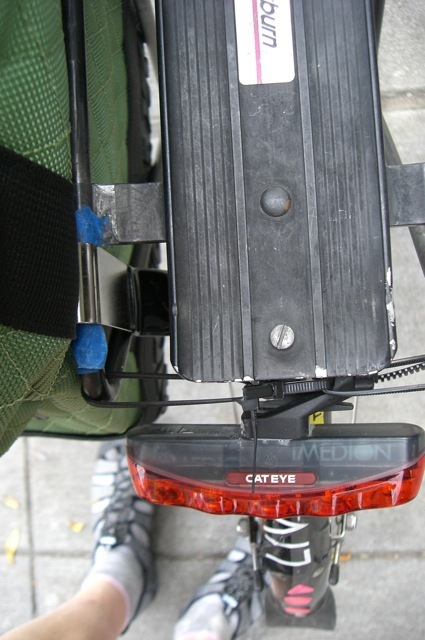 Every other pannier I have ever owned has had a bottom hook to secure it to the rack from below with an internal bungee. I made a mental note to check on it after a couple of miles and I was off. Given the fact that my route from home to Ballard covers some of the bumpiest, least maintained roads in the city, I wasn't too surprised when I checked on it to see that it was precariously hanging on with just one hook. The pannier had slid backwards (while all my others slide forward, hmm) and the rear hook had slipped off the rack so that it was dangling by just the hook, with all the weight on it. Fortunately, it didn't break and when I got home, I jury-rigged a rear bar for my rack from zip-ties to prevent further problems. I was so pleased with the other aspects of this pannier's performance and abilities that I was willing to put some time and energy into making it work. And then I went out again to really make the pannier work. I went grocery shopping and filled it to the point where I could barely zip the top closed; it held a lot of groceries! The tag that came with it lists its uses as shopping, commuting and yard sales. I'd like to add school and hauling stuff to that list. This is a high-capacity, fully functioning pannier that looks great and is fun to use.